Hurricane Katrina was with no doubt one of the deadliest, most destructive hurricanes the Atlantic Coast of the United States has ever experienced. 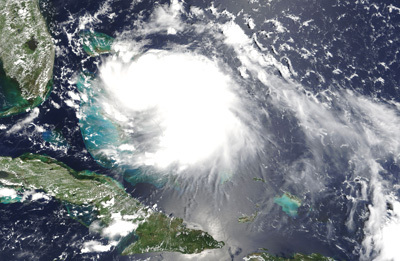 The last week of August 2005, the seemingly innocent Category 1 hurricane began in the Bahamas and moved up past Florida into the Gulf, strengthening into a Category 5 hurricane in the process. After the storm, many towns were left flooded and in various states of damage. Aid came to bigger cities, but smaller towns up the coast were left without supplies for weeks. This is the story of Sub Sea Research’s contribution to some of those smaller Louisiana parishes. In August 2005, Surveyor was working up in Maine while the M/V Diamond was docked in Key West, between trips to Haiti. Key West had been hit by Katrina too, but the storm was weaker than when it got to the Gulf, so damage was minimal there. The Diamond had suffered a few small damages, but nothing that couldn’t be fixed. The current captain Mark Palmer was traveling to Key West to work on the ship when my father, Greg Brooks, was contacted by a man named Gary Burris, who was looking to put together a flotilla of aid to be delivered to the Gulf. He had read about Sub Sea Research online and thought they would be suitable for the relief mission. My dad wanted to help, but wasn’t sure they could afford all the fuel necessary to make the trip. Burris informed him that biodiesel had already been donated to the cause, just so the trip could be completed. With that out of the way, Dad agreed to go on the trip. My dad and his chief engineer, Brian Ryder, loaded up a trailer with all their equipment. They knew the Gulf would be treacherous to navigate, and they needed to be able to locate debris so they could safely make it to their intended target. They drove straight through to St. Petersburg, Florida, which took about 24-26 hours. Captain Mark had brought the Diamond up to meet them, and Gary Burris was waiting too. He had a small amount of donated items, but they knew they were going to need a lot more. They called local TV stations and newspapers, and TV crews and reporters showed up. The newly formed relief mission made a plea to the local people, asking them to bring anything they could spare down to the marina. They were planning on reaching the lower parishes of Louisiana, who had seen the least aid after the hurricane. My dad and the others did TV interviews, spoke with newspaper reporters and even did radio shows. People came out of the woodwork to donate. Items such as food, water, baby diapers, laundry detergent, pet food, and many more came rushing to the ship. The crew was touched by everyone’s generosity, and the humanity that was evident in the kindness the St. Petersburg people were showing for strangers in need. A local shrimp boat joined up with the Diamond, and both boats were packed tightly with all of the donations. They knew they could fit more, but time was running out. The people in the Gulf needed their help, and they couldn’t wait any longer to get to them. They set out, taking a television crew from St. Petersburg with them. Diamond was faster than the shrimp boat, so they would have to stop and wait for it every so often. In two days, they had reached the mouth of the Mississippi. They started up the North Channel, which had been recommended to them as a safe route of travel by a local ship. They ran aground as soon as they got in, stuck on a large sandbar. They were stuck there for hours before the tide came in, and finally they got loose. They had to turn around and enter the Main River instead. As soon as they arrived, they started to see the devastation. The whole crew stood out on deck silently, humbled by the sight. There was a section where bark had been ripped off of trees by Katrina’s strong winds. There were many sunken boats, and thousand ton barges had been thrown up on land like they were made out of paper. Docks were collapsed, and houses had washed up on banks. Pick up trucks floated in the water, upside down. The crew stood there, looking at these sights, and feeling even more motivated to get to the people whose lives had been ripped apart by this storm. There was a makeshift dock formed at one of the Louisiana parishes that had been hit the hardest by the storm. The M/V Diamond and its shrimp boat companion pulled up to the dock later that day. The National Guard was there, ensuring everyone’s safety. Many people showed up to help unload the supplies, which were put into trucks and driven to the center of town, where they could be properly distributed. Some people asked for bread, since they hadn’t eaten any in weeks. Unfortunately foods like bread were not brought along, since they are perishable and in the Louisiana heat, they would not have lasted for more than a couple of days. Many other types of non-perishable foods were given out, and the townspeople shared their gratitude with the relief crew. Just after everything had been distributed, Hurricane Rita was announced. It was coming up the same path that Hurricane Katrina had taken, and so the M/V Diamond and the shrimp boat would have to leave right away. There was no way they could outrun the storm, and to return to Florida would send them right into its center. They took shelter in New Orleans, which would be hit less severely than the Gulf. Once the brunt of the storm had passed, the Diamond headed back to Florida while my Dad decided to fly ahead of it so he could get back to work. In order to get to the airport, he had to be escorted by a state trooper through the wreckage of New Orleans. Dad said this was one of the most surreal experiences of his life. Parts of the city were still completely flooded, and the ones that weren’t were eroded and damaged by seawater. Cars were flipped over and buildings were torn down. The eeriest part of all is that this city, once bustling with life, was completely empty. It was like a ghost town. The police car drove through, mile after mile, and my dad didn’t see one person outside for the whole ride. Knowing that one hurricane had been replaced by another was disheartening, but they knew that the relief would help many people survive through the tough times ahead.